The Rijksmuseum is a must-see when you visit Amsterdam. Discover famous works from the Dutch Golden Age, including Rembrandt van Rijn’s Night Watch. 8,000 objects in 80 rooms tell the story of 800 years of Dutch art and history. 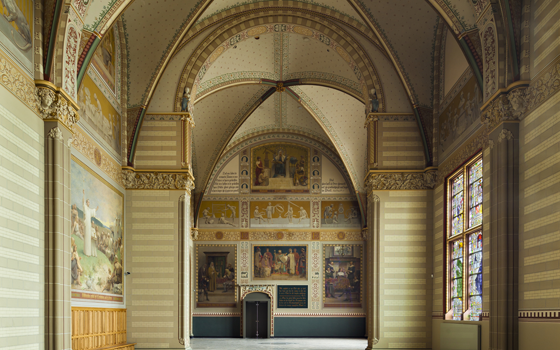 The Rijksmuseum’s world-famous collection is now presented in an entirely new way. Visitors can now travel through time and experience a sense of beauty and time. 8,000 objects in 80 rooms tell the story of 800 years of Dutch art and history. Night Watch, Rembrandt van Rijn most well-known painting that is famous throughout the world. The museum’s Gallery of Honour in which paintings from great masters are displayed, including Frans Hals, Jan Steen, Vermeer and Rembrandt. Even if you have only little time to spare for a visit, this is where you can see the best of the Golden Age in one place. Discover life in the Golden Age by exploring the centuries-old doll’s houses, the oldest of which dates from 1676. The Cuypersbibliotheek is the biggest and oldest art history library in Holland. A far-reaching renovation has restored the space to its original grandeur. The museum organises several exhibitions in the Philips Wing every year, showcasing works from its own collection as well as (inter)national loans. There is a coffee corner in the Philips Wing. You can also buy exhibition catalogues and gifts associated with the exhibitions here. The Rijksmuseum in Amsterdam will honor Rembrandt van Rijn with prestigious exhibitions in this theme year. See the biggest collection of Rembrandt’s paintings ever in a single exhibition and discover why Rembrandt is still one of the world’s greatest artists. In the fall, you can see a number of works by Spanish masters exhibited side by side with the Dutch masters of the Golden Age. The Rijksmuseum Garden, Rijksshop and Café are accessible even without tickets from 9:00 to 18:00. Would you like to combine your visit with lunch or dinner? RIJKS® is the Rijksmuseum’s restaurant open daily from 11:30 to 22:00. Whether you are planning a short or a longer stay in Amsterdam, the Rijksmuseum is a must-see. It is open daily from 9:00 to 17:00. The museum’s ticket desk closes at 16:30.